The following outline is provided as general guide for registering a child at Westboro Academy. Parents or guardians who are financially responsible for any student attending Westboro Academy are required to sign an Enrolment Contract that delineates the payment amounts and options as well as the school’s and parents’ responsibilities. Operating as a not-for-profit charitable organization, Westboro Academy also relies on donations and fund-raising activities for the acquisition of some educational materials, equipment, contingencies, and a building fund. The school will issue tax receipts for all financial donations. Application Fee: a $100 non-refundable application fee must accompany the Application for Admission for new students. The fee covers the cost of interviews, evaluations, and administration. Family Fee: JK – Gr. 6: $1,000; Gr. 7 & 8: $500. This one-time fee is payable upon acceptance of an offer of admission for the first child from each family new to Westboro Academy. The fee is used to enhance the school’s strategic fund. Enrolment Deposit: ($1,000 non-refundable). For current students, the deposit is due by February 1, 2017. It is credited towards Tuition Fees payable and is required to reserve a space for your child. For new students, the fee is payable upon enrolment. Tuition Fees: The Tuition Fees cover the costs associated with receiving an education at Westboro Academy including items such as staff salaries and rental of the school premises. There is a 10% sibling discount for tuition for a second child and a 15% discount for a third child in the same family. Westboro Academy offers three payment options; one full payment, two installments or 10 equal instalments. Activity & Consumables Fee: A lump sum fee, payable separately, is added to the Tuition Fee to cover the cost of consumable items such as writing supplies, workbooks, textbooks, and science experiment materials. This fee also covers the full cost of regular field trips ‍‍‍and other events that are an integral part of the academic program. (Out of town, overnight trips, and ski trips are an additional cost). Student Account: A student account is set up at the beginning of the year for each student. 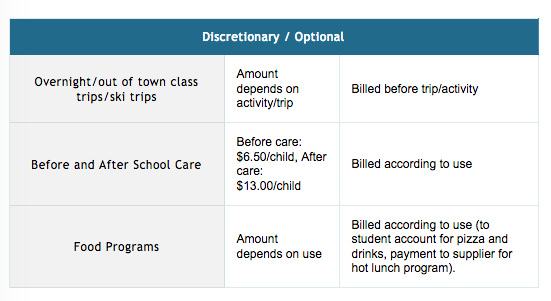 Costs incurred by the student for school-related expenses including lunch beverages, Before and After School Program and used uniform items are drawn from this account. It is requested that each account maintains a $400 balance. Deposits can be made by delivering cheques to the school.